Tracy McGrady nearly put up a triple double in his return from injury while Boston and Cleveland were both victorious. Again. Warriors can't hang with the Rockets. Houston's 119-108 win against a depleted Golden State team was never in doubt, thanks especially to a 24-10-9 performance from Tracy McGrady. Left with a pretty thin roster thanks to injuries and the Al Harrington trade the Warriors resigned themselves to a night of 22 jacked-up threes. Sadly they made just four of them. Stephen Jackson and Jamal Crawford, the team's foremost veteran scorers, combined to shoot 3-21 from the field. So yeah, Don Nelson is going to be pretty hungover this morning. 14 and counting. Boston trailed New Orleans by a point at the half, but they emerged from their home locker room intent on locking up their 14th straight win. The Hornets were held to just 35% by the stifling Celtic defense while Paul Pierce led the way on the other end with 28 points. 11 isn't bad either. Cleveland extended their own winning streak behind LeBron's 28-7-7 night at Philadelphia's expense. The Sixers out-shot and out-rebounded the Cavs, but they were done in by their 20 turnovers. Richardson's debut. Jason Richardson was one of three Suns to score 21 points, although the two he scored on a reverse alley-oop stood out from the rest. Grant Hill added the final two for Phoenix to clinch a 113-112 win over Orlando. Dwight Howard was dominant at times, although he played just 23 minutes. 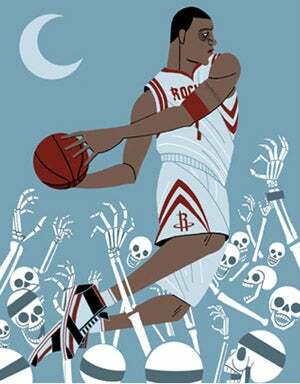 T-Mac print from Free Darko. Buy the book, it is changing lives.